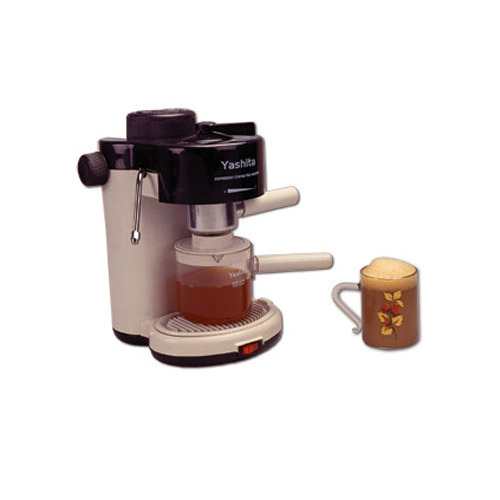 Due to our expertise, we are offering a faultless array of Coffee and Tea Maker Machine to our esteemed customers. These machines are manufactured by the use of quality raw material which is procured from reliable and trustworthy vendors present in the market. Furthermore, these products are accessible in compact designs and various specifications. Additionally, patrons can buy this machine from us at low rate. 30 cups of espresso coffee, 6 cups filter coffee and tea in 3 minutes. Can make coffee and tea simultaneously. Aluminum cap for convenient locking. Steam pipe provides for better foaming. Teflon coated water tank makes descaling easy. Steam controlling by thermostat with indicator. 230 V, 850 W power consumption. One year warranty with after sales service. Established in 1997, Yashita (India) Pvt. Ltd. is involved in Manufacturing, Exporting, Supplying and Trading of Electric Iron, Electric Fans, Mixer Grinder, Coffee and Tea Maker Machines, Heat Convectors, Water Heaters and Electric Ceiling Fans. All our products are of superior quality and best in the industry. Our products are manufactured under the supreme guidance of highly talented professionals and ensure the best quality. We continuously receive the faith of the patrons by delivering extreme reliability and reliable performance in our processed products.